Storing Bamboo Specs in a repository allows you to keep your project configuration together with the code and automatically publish any code changes. It also gives you access to history of plan specification, and makes it easy to revert to a particular moment in time. Go to > Linked repositories. 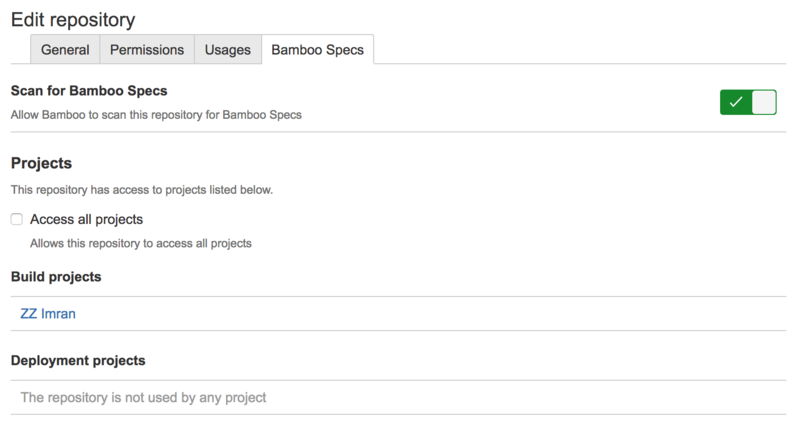 Bamboo Specs from this repository will be able to modify your plans and deployments in Bamboo. Make sure that write permissions to this repository are properly set in Bitbucket Server as any commit to this repository will refresh Bamboo configuration. In the Projects section, select which projects Bamboo Specs can access. Available only for Bamboo administrators. Use this option if you want to have a repository managing multiple build plans and deployment projects in your Bamboo instance. You can also use this option if you want to be able to create new build projects and deployment projects from Bamboo Specs. You must have project administrator or Bamboo administrator permissions to add a build project. You can't add new projects here. From the Bamboo header, click Projects. In the top-right corner, click Project settings. In the sidebar, click Bamboo Specs repositories. In case a plan downloads artifacts from another project (the Artifact Downloader task) or triggers builds of plans in another projects (the Dependencies tab on Plan configuration page), you have to grant access to these projects as well. You must have project administrator or Bamboo administrator permissions to add a deployment project. You can't add new projects here. From the Bamboo header, click Deploy > All Deployment Projects. In the top-right corner, click [...] > Edit project. Now, Bamboo Specs from this repository will be able to modify this deployment project and environments.Once you have added your repositories, you can see them listed in the Projects section in Linked repositories.